The history of sacramental authority is key to understanding United Methodist ministerial orders. While the language of "sacramental authority" has sometimes been misunderstood and misused, it remains interwoven into United Methodism and is a significant element of the history of Christian ecumenical conversations about ministry. 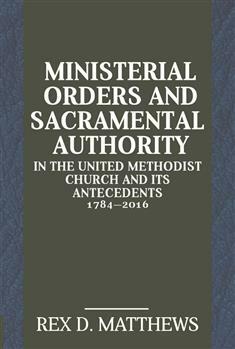 This book traces the changing provisions relating to ministerial orders and sacramental authority in American Methodism, from the formation of the Methodist Episcopal Church in 1784 to the current position of The United Methodist Church and will enable readers to have a richer appreciation and deeper understanding of the context of contemporary discussions about these issues.